Russian artists were at the center of a majestic and spectacular revolution that changed the way we understand art. “Inventing Abstraction 1910-1925,” an exhibition at MOMA that runs through April 15, tells the story of how abstraction evolved among an international group of artists. The museum has brought the most significant and majestic pieces of the movement to New York, including the works of Russian artists Kandinsky, Kazimir Malevich and Vladimir Tatlin, who were at the forefront of this spectacular revolution in 20th-century art. Only one quarter of the works belongs to MOMA; the rest were loaned from more than 100 private collections and institutions, including the Tate museum in London, Centre Pompidou in Paris and the State Museum in Amsterdam, among others. Abstraction resulted from the interaction among painters, musicians, and poets. MOMA’s curators joined with professors from Columbia Business School to create a diagram of connections among artists of that time period. They researched and documented all known meetings, letters and contacts to indicate the most influential figures — key connectors — like Pablo Picasso and Kandinsky. Russian artists Mikhail Larionov and Natalia Goncharova were also part of this network. “We wanted to do our best to give this idea that abstraction could spread like a wild fire, the way it did,” said Chlenova. In 1910, Pablo Picasso made a small series of paintings that did not look like anything before them — the images were similar to diagrams with angles and a barely recognizable female figure. 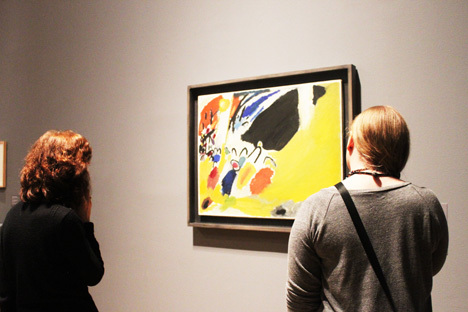 While Picasso was making his first efforts at abstraction in painting, Kandinsky was working on his highly influential manuscript “On the Spiritual in Art,” which was published in 1911, the same year he first exhibited his “Composition V,” that is now on a display at MOMA. Kandinsky was sent images of Picasso’s paintings. The show underscores how the artists constantly influenced each other’s creative process. The 1911 exhibition had a profound effect on other significant artists of the time, including Marcel Duchamp, Paul Klee and Robert Delaunay. The curators of the MOMA exhibition dedicate different rooms and spaces to the abstractionists from different countries. The Russian Wall is a tribute to the exhibition that took place in 1915 in Petrograd (now St. Petersburg) “0,10: The Last Futurist Exhibition of Painting,” where Malevich introduced his idea of the supremacy of painting. MOMA’s curators brought together the original works to recreate as close as possible the original wall – with the exception of the three paintings that are still in Russia. Due to the current ban on art loans from Russia to the United States, these works did not make it to the exhibition. Tatlin was also a part of the “0,10”exhibition in Petrograd and became one of the most influential artists of the Russian avant garde. An iconic model of the proposed tower, “Monument to the Third International” is on display at MOMA. The monument has become emblematic of early Modernism and the Constructivist movement. After the Russian Revolution, Lenin launched the strategy of using visual monumental art as a type of propaganda. “Monument to the Third International” was to be taller than the Eiffel Tower and made out of steel and glass to show the transparency and modernism of the new Soviet party. Tatlin built three models but none of them survived and the model at MOMA is a reconstruction. MOMA has one of the most important collections of Russian avant garde art, thanks to the museum’s founder Alfred Barr, said Chlenova. Barr laid a strong foundation by bringing pieces from Russia and all over Europe in the early 1930s for the famous exhibition “Cubism and Abstract Art” in 1936. That exhibition established MOMA’s reputation as a museum that promotes abstraction. Barr managed to collect art from Soviet painters at a time when abstraction was already forbidden by the government. Malevich left some of his paintings in Germany and Barr brought them to MOMA. The painting “White on White,” was one of the paintings Barr brought from Germany and is on display at the current show.